My talk during the evening program last night went well. But first, the highlight of the week. g square number will be drawn.” Wasn’t sure when I read it what that meant. I rode to the school, which is less than a mile from Verkamp’s, on a bicycle provided for the artists-in-residence. 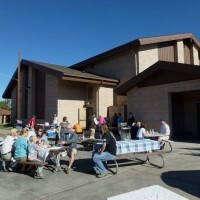 It was a beautiful morning, and they had set out tables near the entrance to the school kitchen. The pancakes and sausage were delicious. I sat with people who worked for the GC Association and Xanterra, the park concessions contractor. 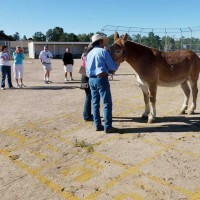 They explained to the city visitor that there would be a big grid and the mule would walk around it until he pooped. Pretty simple. I walked over to the baseball field to look at the neat squares, each 3 feet on each side. Max, the handler, was with Mr. Sleepy, the mule, as Mr. Sleepy grazed on the outfield grass. 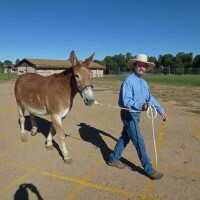 Max brought the mule over to the grid and began to walk him back and forth. A few more people gathered to watch Mr. Sleepy, who must have been a bit anxious with this group of humans staring at him. Aside from grass, I found out that Mr. Sleepy likes to eat Oreo cookies. After a while, someone suggested giving Mr. Sleepy a laxative to help. Occasionally, Mr. Sleepy would stop to chew some patches of grass, apparently more interested in eating than pooping. After about an hour, nothing happened, and I said goodbye. Now about the talk. The program coordinator asks each artist-in-residence to give a presentation. People do performances, demonstrate their art, give a talk or give a talk with a slide show, which I did last night. About 50 to 60 people showed up, and many asked questions about photography or equipment. I showed previous night sky pictures I had taken, some examples of the assignments I’ve done over the past few months, and photos that I’ve taken this past week at the canyon. It seemed to go well. A small crowd gathered afterward to ask questions and see the equipment I brought.